Prominent & Leading Exporter from Delhi, we offer designer festival lehenga for ladies, heavy designer lehenga for party, exclusive heavy top with lehenga for festival, exclusive lehengas and new exclusive lehengas. Designer Festival Lehenga for Ladies in Black Shade, Stone Embroidery on Front Neck & back on Top in Silk, Brocade Silk Skirt, Nett 4 sided Dupatta.. Sleeves can be attached, any size can be done.. 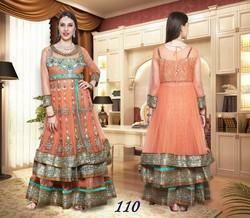 Heavy Designer Beautiful Lehenga for Party in Peach and Light Green color. Full Stone Embroidered Yoke, Heavy Flair with the Heavy Borders. Exclusive Heavy Top with Lehenga for Festival in Blue, Stone Embroidery on Front Neck of the Top in Silk, Brocade Silk Skirt, Nett 4 Sided Dupatta.. Sleeves can be attached, Any size can be done.. Designer Lehengas offered comes with a beautiful drape and enchanting work done on the fabric that showcases beautiful embroidered patterns and other thread work that adds vibrant looks to these lehengas. Further, this mesmerizing collection come designed as per latest fashion trends and is developed using soft fabric which makes these highly comfortable to wear for all day long. Some of its features include provide for stylish looks; support adding a fashionable appearance to the persona of wearers; provide for beautiful and gorgeous dressed looks; made available in different size options and exciting finish patterns. Heavy Exclusive Lehengas offered comes designed and developed in enchanting presentation finish and perfectly match up to the exclusive tastes of the ladies. Further, these also match up to the tastes of women who want to look at their glamorous best on all occasions. 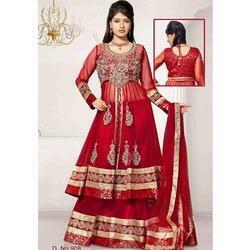 Some of its features include gorgeous presentation finish in rich shades of colors; lehengas perfect for adding shimmer to overall dress appeal of ladies; intricately embellished design work provided on fabric for imparting beautiful dressed looks; ornamental styled appearance that is perfect to providing glamorous dressed looks on all occasions. Wedding Lehenga offered are best known for their creative trendy patterns as well as smooth soft fabric finish which makes these lehengas highly exciting options to be worn during occasions like wedding. Further, the beautiful and mesmerizing embroidery and other thread embellishing work also makes it a perfect bridal wear choice. Some of its features include offered in numerous styles that add to feminine charm of ladies; provide for glamorous dressed appeal; designer drape that lends contemporary touch to wearer’s dressed appearance; excellent craftsmanship standards that match up with emerging tastes and finish choices of customers. 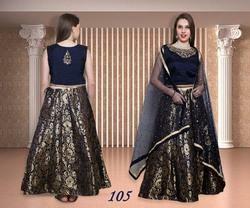 Manufacturer & Exporter of New Exclusive Lehengas & Exclusive Lehengas. Our product range also comprises of Designer Wedding Lehengas, Necklace Sets and Fancy Designer Bangles.